This Saturday, the Doctor and his companion Clara will find themselves in Victorian London, along with Madame Vastra, Jenny Flint, Strax and a free-roaming dinosaur. 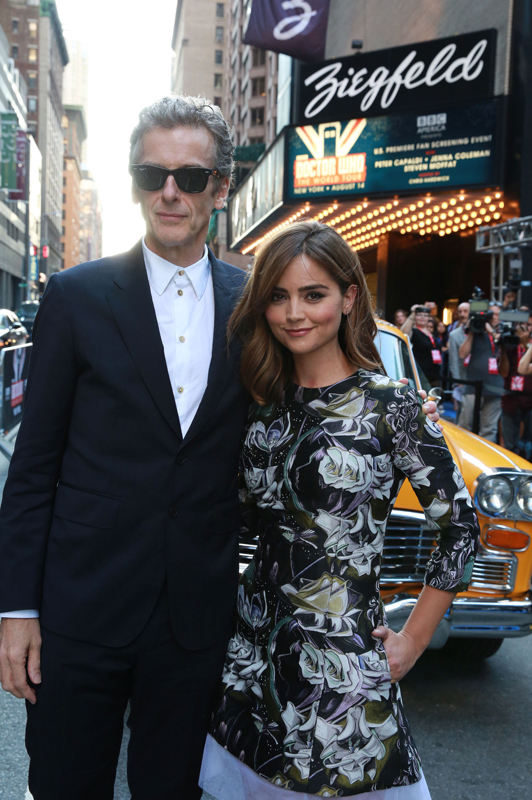 As fans gear up for the 12th Doctor and his companion’s adventures, Peter Capaldi and Jenna Coleman, the actors who portray the two lead characters, have been embarking on their own global adventure. 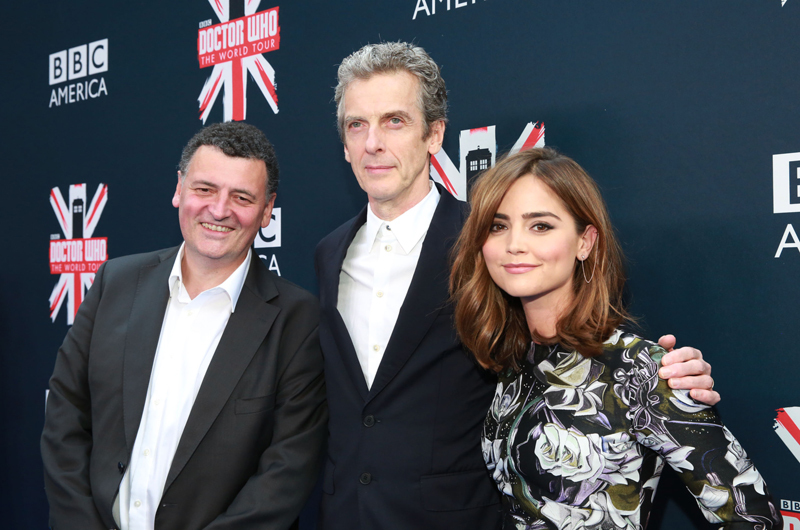 “Doctor Who: The World Tour” has Capaldi, Coleman and showrunner Steven Moffat visiting seven cities in five different continents in 12 days to promote the new season. This past Thursday, the trio were in New York for a fan screening at the Ziegfeld Theater, the same venue Matt Smith and Karen Gillan screened the series seven premiere for fans in 2012. That morning, before the fan screening, Capaldi, Coleman and Moffat held a Q&A session with reporters to promote the new season, which BBC America graciously invited HoboTrashcan to attend. The biggest question reporters had was what kind of Doctor Capaldi would be. What would he bring to the show that would differentiate him from the 11 previous Doctors? “Well, the thing I always wanted to bring to it was me. 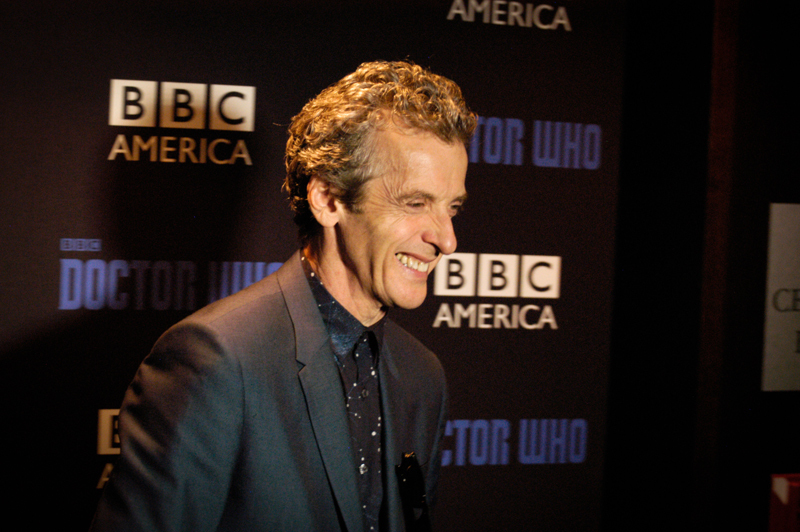 So I got lucky with that one,” joked Capaldi. Becoming the Doctor wasn’t something Capaldi thought would ever been in the card, even though he was a huge fan of Doctor Who as a child. When he appeared as Caecilius in the 2008 episode “The Fires of Pompeii” alongside David Tennant’s 10th Doctor, he figured that would be the extent of his time on Doctor Who. In “Deep Breath,” there is a winking acknowledgement of Capaldi’s previous appearance as the Doctor looks in a mirror and wonders why he chose this new face, feeling like it is somehow familiar to him. Moffat wouldn’t clarify whether or not this would be the only reference to Capaldi’s previous role on the show, but he did say that it’s not something they will dwell on for very long. Capaldi’s appearance isn’t the only difference from previous Doctors. 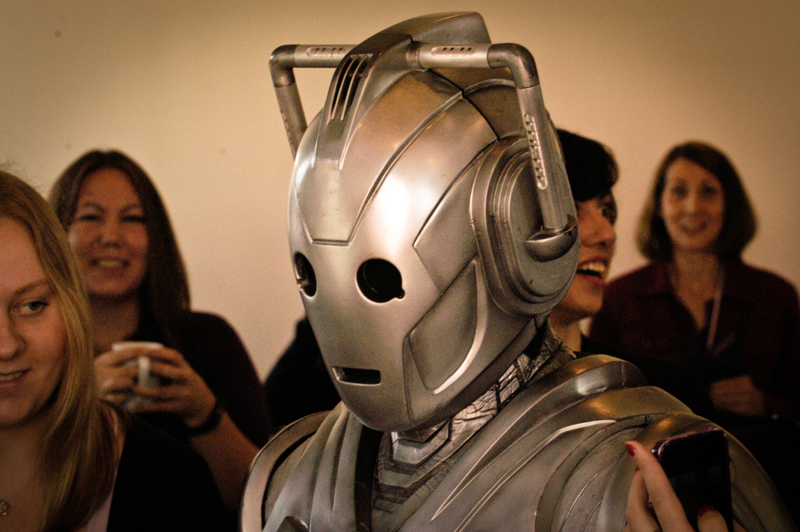 His costar Coleman found him much more reserved than previous Doctor Matt Smith. Capaldi expanded on the reason he was withholding in his performance, explaining that he wanted to hint at a deeper, hidden part of the character. “The great thing to me about the Doctor has always been that there is an unknown Doctor. There’s the character who presents himself to the people around him. But there’s always this sense that there’s another aspect to him, which is untouchable and unreachable. And I never really quite know how you play that. But the only way you could – that I thought you could try and evoke it was by being ungrabbable. 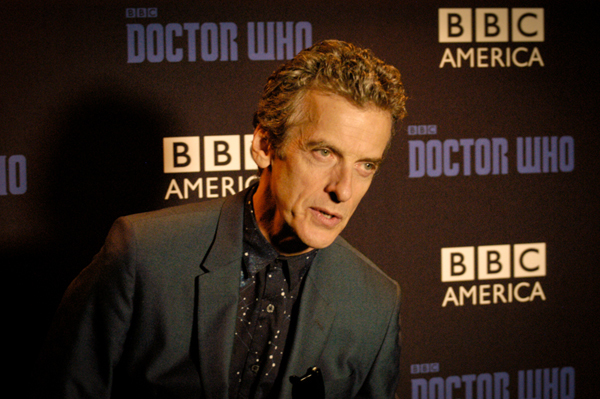 That you can’t actually predict what he’s going to do,” said Capaldi. The difference in the performance was something that took Coleman a bit by surprise. “Normally when you read the script, at this point the Doctor would embrace this scene or dance or be running around the console and actually, there were times when I think, especially in the early days when Peter was finding his Doctor, he would say, ‘Actually, no, I’m just going to stand here.’ It’s that thing where instead of going to the room, the room coming to him. And I feel like he was really bold and brave and made those changes, and that was because that was Peter doing it his way,” said Coleman. Of course, while Capaldi was carving out his own version of the Doctor, it was impossible for him not to be influenced by the men who came before him. As a huge fan of the show growing up, Capaldi believes that those early Doctors shaped his acting style during his formative years. While Capaldi and Coleman were getting to know each other on the set, their characters were also feeling each other out. In the show, one minute Coleman’s Clara was staring at Matt Smith’s face and the next minute he regenerated into Peter Capaldi. 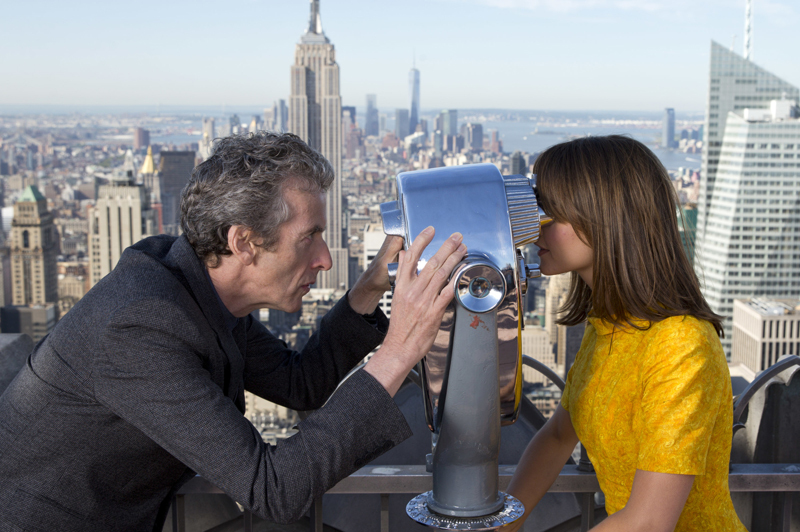 Much of the season premiere, “Deep Breath,” is about Clara trying to figure out who this new man standing before her is and if he is still the same Doctor she’s been traveling with. Capaldi agreed, explaining that even the Doctor is trying to figure out who he is now. While the early episodes of the season will be about the 12th Doctor discovering what kind of man he is, Moffat promised that the sci-fi adventure series won’t devolve into an existential examination of the Time Lord. “First of all, I don’t think we’re going to put in the poster, ‘It’s more of an internal struggle this time,’” said Moffat. “Because you know, there are monsters in corridors, I promise. And explosions. But yeah, I mean, the Doctor’s quite a complicated character, actually. “For a melodramatic hero, he is quite complicated. And I think you’re wasting an opportunity with every regeneration if you don’t do a bit of that, because we know that he doesn’t just change his face. He changes. Things about him aren’t the same. Things he reaches for aren’t there. He has feelings he didn’t have before. I think that must be awfully alarming. It must make you wonder who you are. Written by Joel Murphy. Photos 1 – 4 by Joel Murphy. Photos 5 – 7 by Amy Sussman – BBC America. 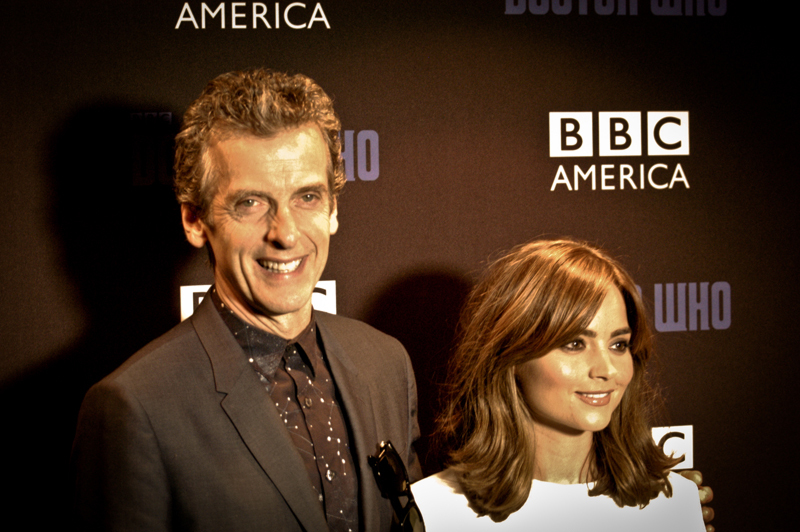 Photo 8 by Brian Ach – BBC America. Doctor Who’s new season premieres Aug. 23 at 8 pm. Check back for weekly recaps.